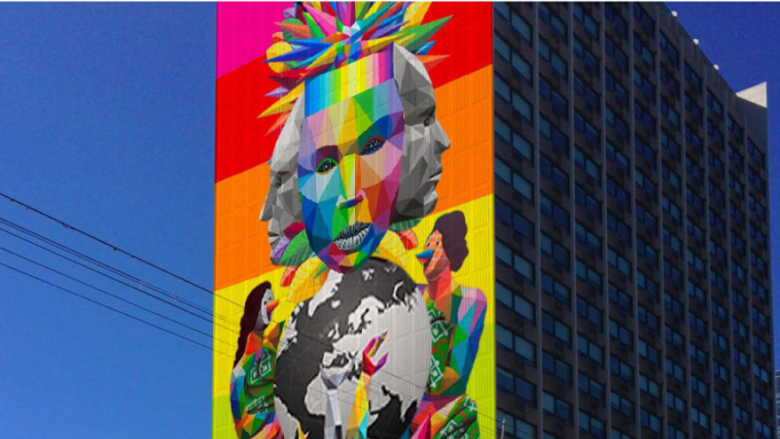 Spanish artist Okuda is coming to Toronto and there's an Edmonton campaign to bring him west, too. 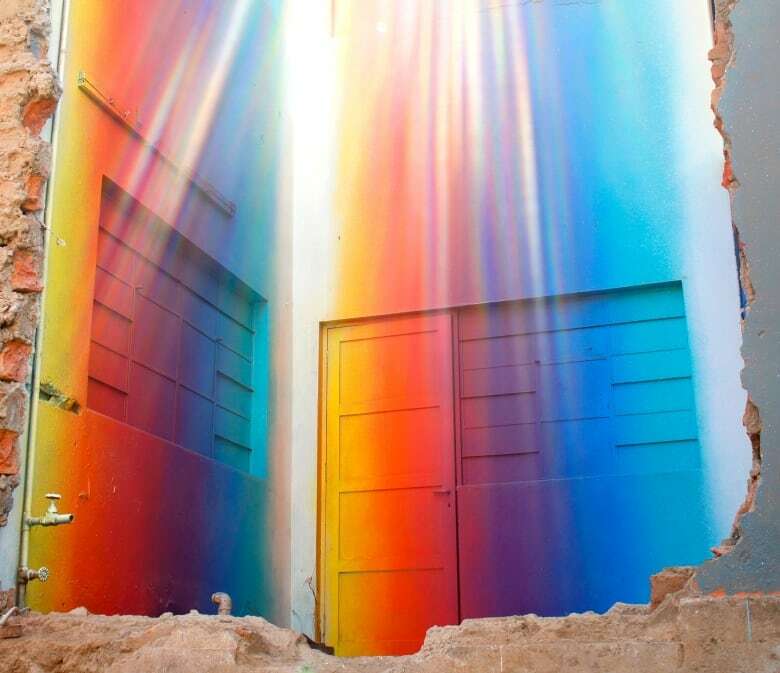 Those stories, plus a rainbow of eye-candy links. Sure, the average Canadian doesn't actually require 1,500 calories worth of eye candy per day, but maybe — just maybe — you're feeling like our team these days. We've been spending a lot of time looking at artwork that could give you a major sugar high, and it might be because we just heard about a new, high-fructose landmark that's about to land in Toronto. A 23-storey tower at the corner of Carlton and Jarvis Sts. 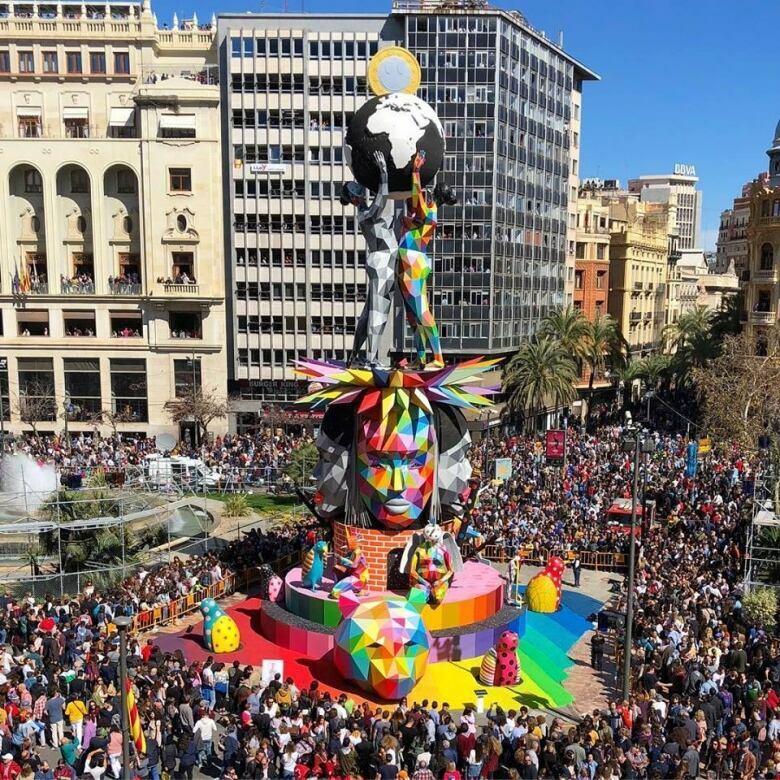 is about to get an extreme, rainbow makeover, courtesy of Spanish street artist Okuda, a guy who's been painting the world red — and orange and yellow and green and blue and indigo and violet. Just check out this spectacle he built — then burned! — in Valencia this spring. No pyrotechnics involved in the upcoming Toronto project (that we know of), but it's the latest mural to be brought to the city by Steps (check out this midtown giant that they commissioned from Phlegm). 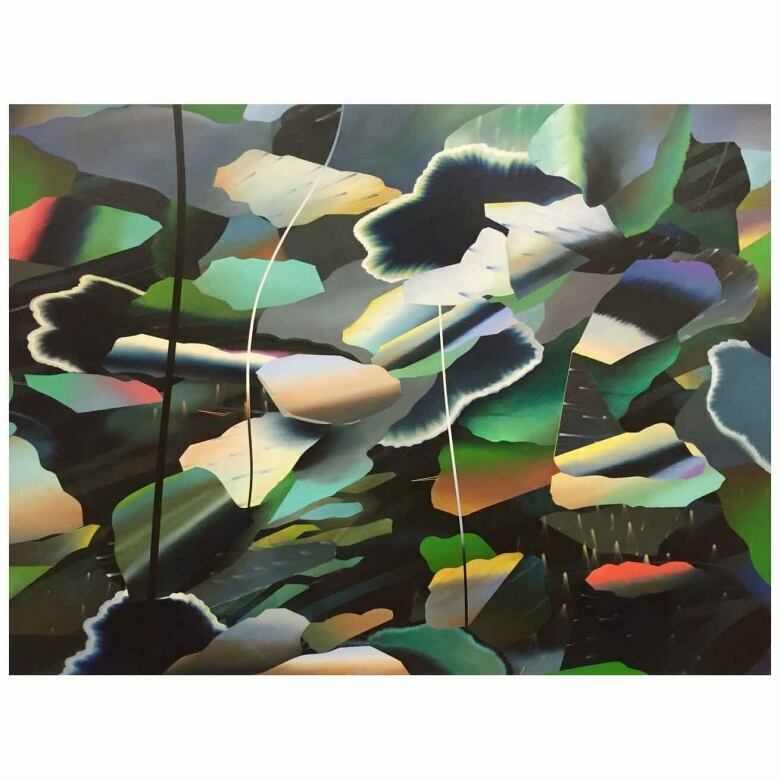 According to Steps, the piece (called "Equilibrium") is going to reference "the universal balance between nature, humanity and knowledge" and painting is expected to start in early July. Plus, #Hashtag Gallery will be hosting an exhibition of his new paintings while he's here. 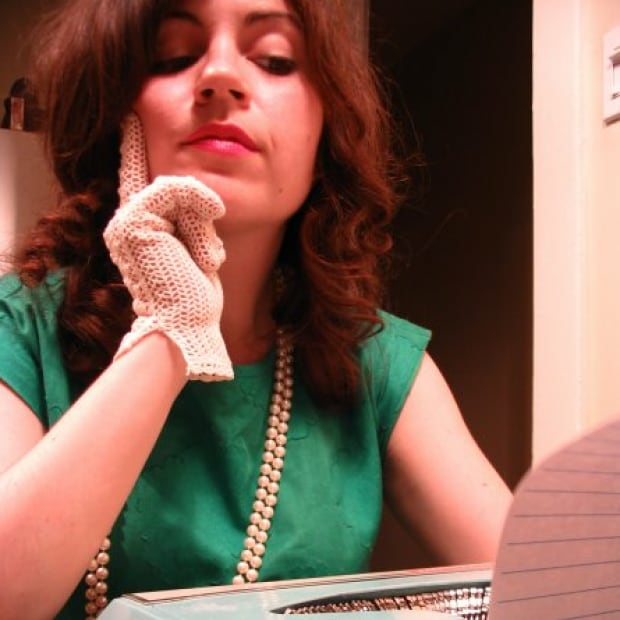 Horses & Muses runs July 7 to 29 at the space. And could Okuda be following the rainbow to Edmonton, next? A crowdfunding campaign was launched this week, hoping to draw the artist out west, and according to CBC Edmonton, he's already started planning the mural. Organizers need to raise $40,000 to make it happen, but if they're successful, the mural — planned for the Crawford Block building off of Whyte Ave. — will be the largest (and possibly brightest) in the city. Got some eye-popping artwork to show us? Maybe a pic of the best and brightest mural in your hometown? Let's see it! We're always an email away. Would love to hear what you'd like to see in next week's note. But first, get ready to feel like a unicorn just licked your eyeballs, because these links are loaded with rainbow colour. 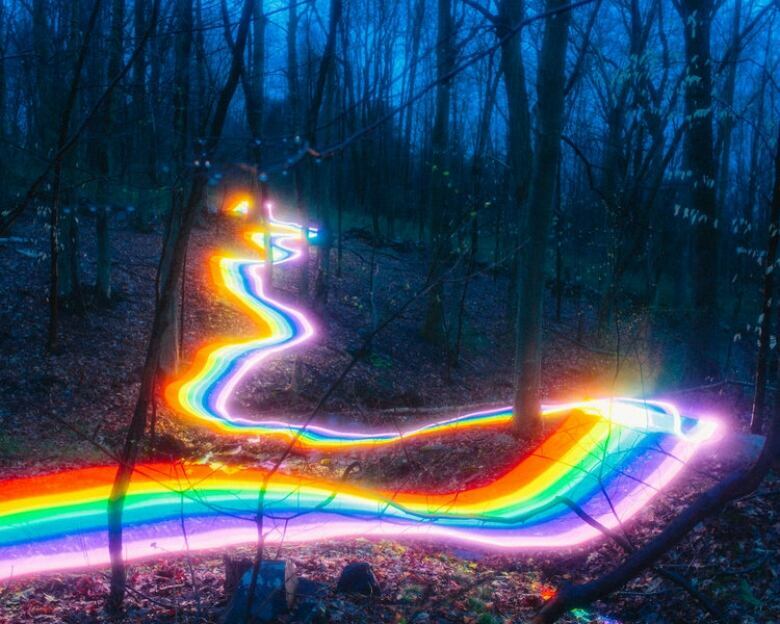 We don't know where this "Rainbow Road" leads, but as soon as you check out the magic that Daniel and Katina Mercadante are creating in this photo series, you'll be along for the ride. They conjured those neon rainbows with DIY lighting rigs. We love how they weave through forests and back alleys and beaches. This isn't Photoshop. Honest. But yeah, these eye-popping murals by Xomatok definitely look like they were painted with the gradient tool. Colour bombs, away! 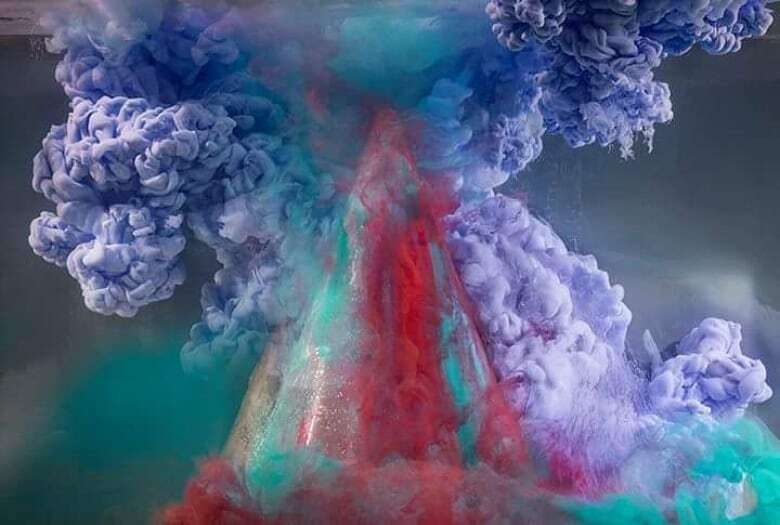 If you've never stumbled on Kim Keever's artwork before, Juxtapoz just put the spotlight on a few of his best images. Oh, the things he can do with paint, a camera and a massive fish tank full of water. Read this before starting your summer vacation - New series alert: City guides! We recruited artists around the country to spill insider tips about their hometowns for our series I He(art) My City. Plan your great Canadian road trips accordingly. Her father overdosed. 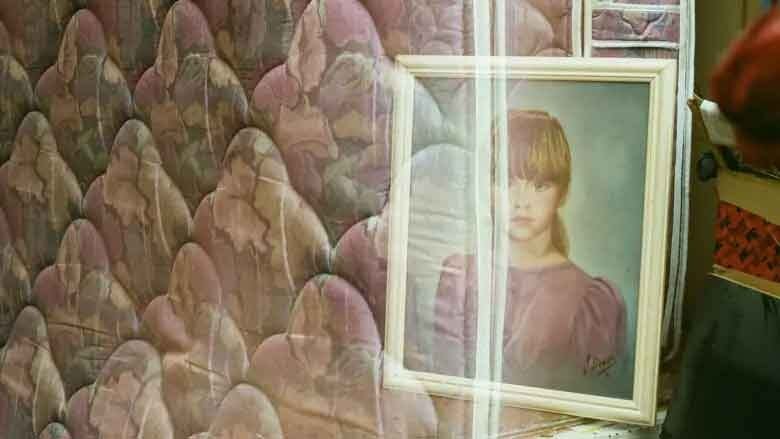 These photos are her powerful tribute - If you ever needed a reminder that the opioid crisis is about more than statistics, this deeply personal story is it. If only there were a place like this on Airbnb - What kind of tree house would you have built as a kid? 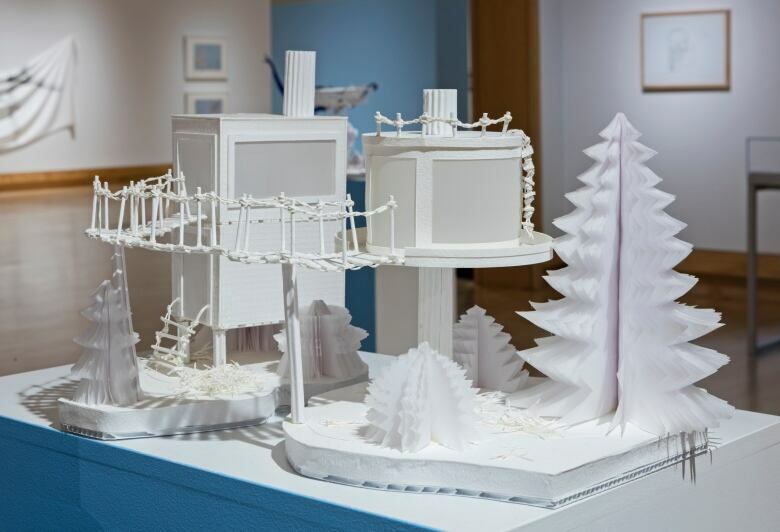 Jennie Suddick's been talking to people around the country and making (tiny) tree houses based on their plans. Rope bridges AND puppy rooms? Sign us up! "I'll Go There With You" by Eric Louie. Go where? How about his Vancouver studio! We got to peek inside for the new episode of Art Minute. Got questions? Story tips? Typo catches? Just want to say hi? Hit us up over email whenever. We're here all week, and we'll do our best to respond.